We dropped anchor at Cabo San Francisco that afternoon. A loud yet silent rainforest was awaiting us, the silence from the lack of man-made sounds, and the surprising loudness of rain on large leaves, waterfalls, trickles, streams, insects, birds and animals. This was our first landfall in Venezuela and I was impressed. We were so used to the murky water of Trinidad, it was a relief to see clean water again. The anchor had no sooner hit bottom and dad was in the water. 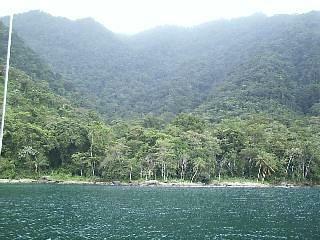 The beach that stretches along one side of the bay, also leads you up a sparkling stream, trickling down the mountain. We started up the stream, machete in hand. We found a few breadfruit and mom, eager to take pictures, made us pose on a big rock. Looking up at the jungle was breathtaking, thick mist covered forest as far as the eye could see, a silk blanket cloaked mystery. We left that night and arrived in Los Testigos at eight am. The sand dunes that tower over the bay have a few shrubs and a lot of memories. 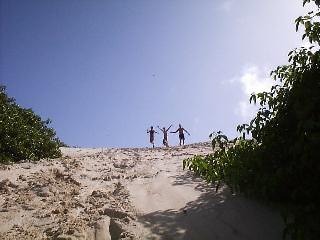 Climbing up the dunes is a time consuming thing. A treadmill, every step forward is half a step back. Mom took a picture of us running down the dunes, which was very funny, arms and legs flying in the air and a cloud of dust as Jack, our dog zooms down. The snorkeling was great, and I soon set out my daily routine of letting the fish out of the traps. Now don't get me wrong I do eat fish, but not angels and parrot fish. Seeing the fish swim away unharmed gives me a warm feeling in my heart, like I just swallowed a spoon of hot honey. The dog on the beach was the funniest I ever saw, a Mexican cross breed without any hair except a tuft on the end of the tail and around the ears. In the afternoon of the 14th August we arrived in Margarita. "Steadfast", "Khayamanzi" and "Lily Maid" were there too. This was the first time Lee- Ann, Tristan and Ben had met and it looked like they were getting along fine. Lee-Ann and I went snorkeling under "Gilana" and we found a little octopus about an inch long. We took some pictures of this for we had no idea when we would see one so small again. The beach that runs along the bay is covered with shells and I spent many hours sifting my hands through the grainy sand. Jackie's bar across the bay is always packed. At first glance you would think the circus is in town, but the tent covers the eating area. The meals are superb and beautifully presented for a good price. At the bar there is a selection of fruits, bananas, strawberries, melons, pineapple and many more. The fruit are used in a fresh fruit juice, you go up to the bar, pick the fruit you want in your drink, watch it being made and enjoy. The colourful blue party barge has music notes painted all over it. At about nine o clock the singer starts setting up the sound system "Uno!, Uno!-dos-tres" Margarita is a permaparty, always festive, it rocks to a Latino ritmo, "Duty free" is everywhere, but beware the pickpockets. On nearby Isla Coche, the long white beach stretches as far as the eye can see, boardsailers from all over the world come here to practice, conditions are ideal 99% of the time. Ashore dune buggies tow hang gliders aloft. The water is not very clear so snorkelling is not an option, but rolling in the surf are newly polished shells, waiting to be scooped up in a collectors hands. We stayed in Coche for four days leaving for Isla Cubagua early one misty morning. Isla Cubagua was the first European settlement in South American waters. The beige beach follows the periphery of the island like a picture frame. In 1492 Spaniards invaded Isla Cubagua and forced Indians to dive for pearls. In one year the island had exported over 800 pounds of pearls. In 1520 a force of well-armed Indians attacked the island, and forced the Spaniards to leave, but that was not the end, the Spaniards retaliated and rebuilt the citadel stronger than it had ever been before. Christmas Day, 1541, earths tectonic plates shifted causing an earthquake and tidal wave, in just a few minutes everything had slipped beneath the sea. We walked around the island to have a look at this underwater city. Unfortunately I had a cold and could not swim, but while the others were snorkeling I busied myself collecting shells and bones! Believe it or not I found the jaws of a Moray Eel and turtle. One of the most plentiful shells were lion's paws or cat's paws. It is the shape of a scallop, but along the grains of the shell are knobbly bumps looking like knuckles on a cats paw. The next day en route to Robledal we paused briefly at Bahia Mangle to get fuel. At Robledal we filled our tanks with water. We were now ready to explore the offshore islands which have zero supplies but unlimited fun.